Would this ever happen to a writer? Would that ever happen? Probably not. Why? Because the story doesn’t exist yet. So the fact that producing it is creative work someone has to do would (normally) limit the ludicrous impulse to suggest that someone do all that work for free. But what if a photo already exists? A photo of the exact subject the magazine wants. Like the race in question is in the rear view mirror a month ago and you happened to be there. All the work and expense of getting the photo is “done”, the photo’s sitting right there, and boy is it nice. The magazine sees it, and makes the same request. “Do you mind if we use your photo?” The implication is: for free. For some weird reason, the perception is that because the photo is “done” it should be free. Note this same mindset doesn’t apply to a slice of pizza sitting on the counter, or a car in the lot, or a coat in a store. You would never walk in to a store and say “Do you guys have any coats around we could use?” You mean – “buy”? But it happens all the time for photos. All the time. Even people and groups that should know better do it. All. The. Time. For example, here’s a bizarre request from the clueless Oregon Arts Commission asking photographers to give their work away for free. Of all groups, shouldn’t the Oregon Arts Commission support artists getting paid for their work? Apparently they expect photographers to give it away for free. Note that weird sense that photos just somehow magically make themselves and lie around waiting to be used? Hello? 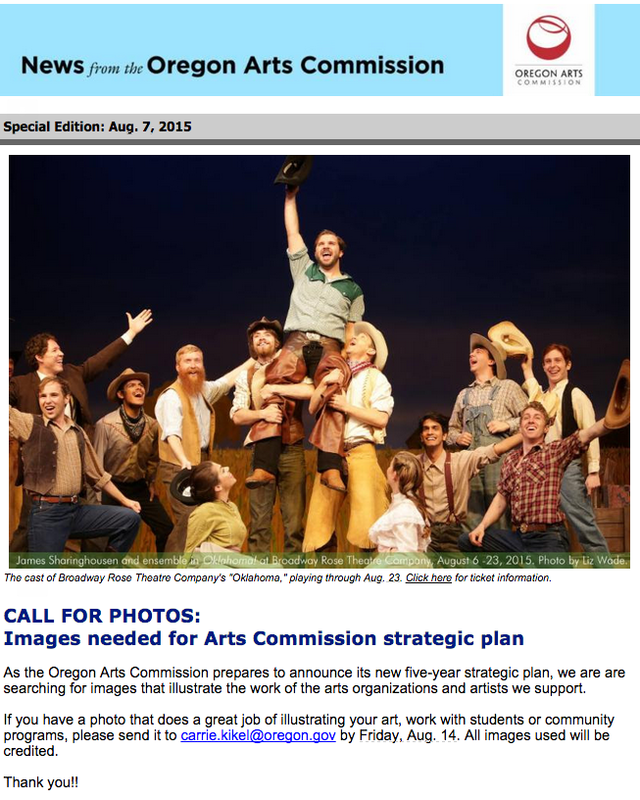 Isn’t the whole point of the bureaucracy-encrusted OAC to help make life better for artists in Oregon?? Why is the OAC promoting the misperception that photos have no commercial value and should be given away for free? Is the OAC staffed by volunteers? Does the OAC ask event planners and organizers to donate their time to help put on their annual Arts Summit (which isn’t free) and tell them that while they won’t be paid their efforts will be credited? For almost any other service or product, OAC would not dream of asking someone to give them something for free. But somehow photos are different. This is something photographers need to work hard to change. Photography is a creative art just like any other. Today good images are more essential and integral than ever to wondrous online experiences. That’s why everyone is asking for them. Like writing or painting or dancing or any other creative art, photography (if it’s good – and any time anyone uses a photo, that means they think it’s good) should be paid for. So don’t give it away. If you see someone asking for free creative work, point it out. Say no. Ask them why they expect photographers to contribute their work for free – when everything else is paid for. Previous Previous post: Is your email messaging optimized for mobile?